1 Bedroom Condo Located in Mt. 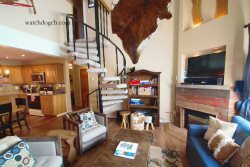 Crested Butte with Fireplace & Amazing Views! 1 Bedroom, 1 Bathroom Condo with Wood Burning Fireplace, Sofa Sleeper & Amazing Views! The Peachtree Condo is located in the Timberline Units; which is a great location directly on the free mountain shuttle route. The living area has two sliding glass doors that lead to small decks. One has a great view overlooking Crested Butte. In the summer, open both and you have a great cross-draft of fresh air! There is wireless internet, television, and a small dining area and bar seating. This condo is remodeled, well-laid out, and has high-end furnishings. It is a great little spot for a couple or small family! In the winter, there is a dedicated ski locker in the hallway for private use. As a friendly FYI, this property is located on the second level of the Timberline condominium complex and stairs are mandatory. Please note that a starter pack of firewood is provided. If you would like additional firewood, deliveries can be arranged for a fee or bundles of wood are available for purchase at Clark's Market in town.